What an awesome shot of the Sable. The composition, POV, Lighting, Sharpness, DOF, BG and detail are all amazingly well done. The Impala in the BG look like they both got a horn missing! How unusual is that? I like the colour tone of this lovely action shot. It looks like a painting, especially with those two other animals in the background. 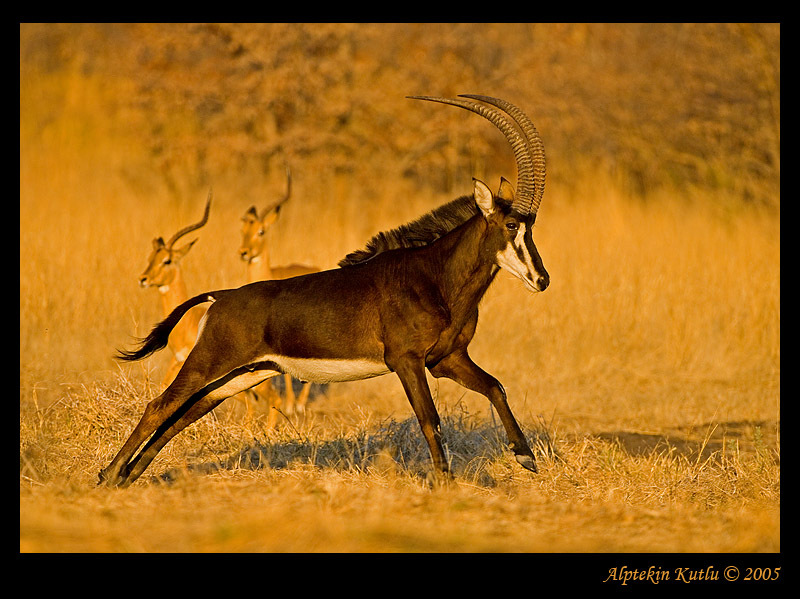 The Antelope itself is so very stately and elegant in appearance, especially in this running movement. Beautiful light , the pose is nice too, really a prized buck. Bravo pour cette belle prise. J'aime bien l'action et les couleurs chaude de cette composition. Wonderful shot. Superb composition. Good sharpness. Great light and colours. The light is special, Alptekin. Beautiful shot again of this magnificent Sable Antelope. Very nicely done with the bright sun shining right on him. You are very lucky to see such a beatuiful animal! This is a "WOW" shot with the Sable taking off and the 2 single horned impalas in the BG and I don't really need to expand on the technical merits, because I believe you got it all figured out. The rest of the amazing material in your portfolio is just as remarkable, but unfortunately there is a "but" for me as well. In my introductory note I say "I normally do not critique any photos without notes unless it is a newish member, and then I will only do it to call upon or motivate such a member to a full participation of the site". I say this because I absolutely believe in and underline the mission statement of TrekNature, i.e. "To learn about Nature through Photography" and this I cannot do by just looking at beautiful photos. Please don't miss understand me. I do appreciate and enjoy your amazing photos, but I (and I am sure so many more TrekNature members and even the global community of Internet viewers that regularly visit this site) will enjoy it even more if you tell us a little more about your subject, or location, or the technical aspects of your shoot, or whatever interesting information you want to share with us relating to the posting. You know how to do it because there are those sporadic few postings where you have provided very interesting and complete notes, but unfortunately the majority of your contributions were accompanied with "one liner" notes. Please accept that this is not an attempt to knock you in any way, but an effort to call upon you to contribute and enjoy TrekNature in an even more rewarding and complete manner. TFS this lovely shot of a very rare antelope.